Matthew Skelton's first published novel was "Endymion Spring." This was a fab book and a hard act to follow. But three years later, Matthew has just published his second book and the question is, has he produced something as great? The book starts off in the Antarctic Circle, with one the main characters known as Seaman James Flux, on board the Destiny. 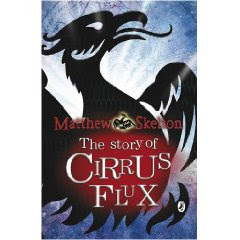 The story then follows the adventures of a boy, Cirrus Flux, as he lives his life as an orphan in the Foundling Hospital. His life takes on many dangers, as he faces evil scoundrels trying to gain his divine power. The story swings back and forwards in strands of time, highlighting the on-going story; reeling you into the plot. Matthew is articulate in his telling of an unusual tale. The many themes and time jumps keeps the reader on their toes. It could have been a dangerous ploy by Matthew but in fact he has created eloquently sequenced and joined time chapters. I enjoyed reading this book, it was enthralling and more difficult to predict the ending. As the true course of the book wasn't properly established or finalised until later. Four out of five, very different to Endymion Spring but refreshingly good. ‘You shall help me find him still . . . there is nowhere for the boy to hide.’ Orphan boy Cirrus Flux is being watched. Merciless rogues are conniving to steal the world’s most divine power, which they believe Cirrus has inherited. Now he faces a perilous journey through the dirty backstreets of London as a sinister mesmerist, a tiny man with an all-seeing eye, and a skull-collecting scoundrel pursue him. Cirrus must escape them. It really is not safe to give such evil people such incredible power . . .
Quick Fact About Matthew Skelton in 2002 he won the Richard and Judy's short story competition. Please email me if you fancy doing the odd children's book review as we like to put up more! !